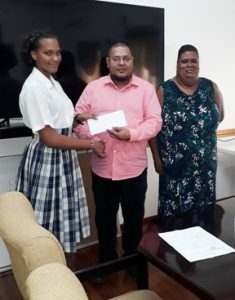 Administrative Manager of the GGDMA Mr. Avalon Jagnandan hands over sponsorship cheque to young Ms. Jonte Menezes in the presence of her mother Ms. Reena Charles. Academy who will be taking part in the Suriname End of the Year Swim Meet on December 15 and 16. Administrative Manager of the GGDMA Avalon Jagnandan handed a cheque to the young swimmer at a simple ceremony held recently. Jagnandan said they are happy to support Menezes and wished her well, while Menezes thanked them for the assistance. She expressed confidence of doing well at the meet adding that she is training five times per week. The swimmer said the support has helped to motivate her. Guyana will be represented by five clubs at the meet namely Sea Otters, Dolphin, Silver Shark, Dorado and Orca of Linden. Among the swimmers that will represent Sea Otters Swim academy are Andrea Persaud, Wilmont Garrett, Mario Ramkhellawan, Marious Ramkhellawan, Krish Ramkhellawan, Sherifa Lewis, Jaleel Anderson and Nikita Peters.